Don't even think of phoning or e-mailing or telegraphing or Pony Express-ing me for the next few hours. At least not until tonight's season premiere of The Walking Dead finishes. 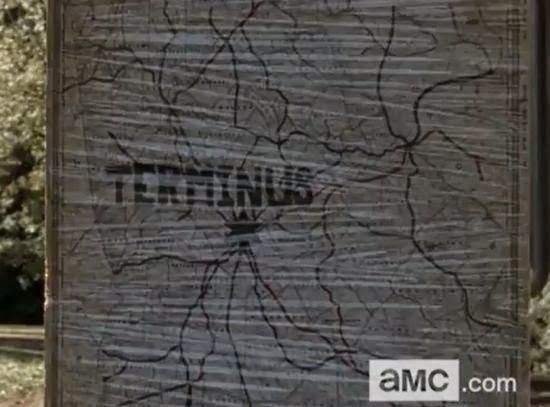 Looking forward to learning more about Terminus. It can't be that bad. Can it? Can it? Will post some thoughts after the show. EDIT 10:15 p.m. EST: Okay I guess Terminus is a bad place after all. "No Sanctuary" was a solid opening for the fifth season. Although, I'm a bit confused as to the history of Terminus: was Lieutenant Tasha Yar and her friends all good guys before they got turned onto the other white meat? Wait... I can't believe I just wrote that. Carol must have pulled off the all-time greatest single-action zombie kill in the history of every media conceivable. She was all kinds of bad-a$$ in this one. This was an episode that pulled the group back together (absent Beth, but after seeing the promo for next week I'd bet that we'll be seeing her again soon). It was an action piece designed to round up everybody and propel them into whatever's coming next. I will admit that the Terminus storyline (if this is the end of it... see what I did there?) was a bit of a letdown after all of that build-up. But if it was meant to be for sake of action and suspense as opposed to propelling the lore forward (though we did get a bit of that with what Scientist Dude said about the disease) then it served its purpose. Next week: Father Gabriel Stokes!